The ARV medicines under a monopoly situation are those offered by a single supplier, generally because they are subject to patent protection (patent application filed or patent granted in the country). Multinational pharmaceutical companies, in turn, have adopted price discrimination policies ("tiered pricing"), creating categories of price discounts based on criteria established by them, which can include country's level of development and/or the national prevalence of HIV.13,24 However, the same criteria are not universally adopted by companies, and countries might be eligible to price discounts offered by some companies but not by others. Although these international initiatives show results in the expansion of access to ARV and addressing some high prices, Brazil is excluded from all of them and has had to develop its own strategies. The study of governmental strategies to ensure access to ARV in a country like Brazil includes understanding the process of technology incorporation in the health system, approaches to ensure availability (regarding the maintenance and expansion of treatment) as well as initiatives for tackling prices of products under a monopoly situation, including efforts for local production. The objective of this study was to analyze Government strategies to reduce the price of antiretroviral medicines for HIV. This is a case study based on the medicine atazanavir, which includes the use of a Partnership for Productive Development (PDP). The methodology involved two steps: analysis of the importance of atazanavir for HIV treatment and its share of the MoH budget for ARV, and comparison of the prices paid by the MoH with international reference prices. Purchases of ARV by the MoH from 2005 to 2013 were analyzed using the records of the General Services Administration Integrated System (SIASG). This system contains information on public purchases by the Federal Public Administration, from the private sector. SIASG does not include purchases from public manufacturers. The volume and unit prices of annual purchases were used to estimate the total expenditure on ARV and the proportion represented by atazanavir per year. The final volume per year was expressed as number of treatments. The cost of treatment per patient per year (number of capsules per day × 365 × median price) was also calculated, using as reference the 2008 treatment guideline of the Ministry of Health for antiretroviral therapy in adults. Median prices were converted to the average US dollar rate for the year (IPEA-data) for comparison with international prices. International prices used were as published by Doctors without Borders,c which tracks the lowest prices charged by multinational companies in different countries and by generic alternatives. The analysis of the PDP for local production of atazanavir aimed to deepen the knowledge about a new Government strategy for price reduction. Among the documents reviewed was the ‘Technical Cooperation Agreement for Sublicensing of Patent Exploitation, Technology Transfer (atazanavir) and Provision signed between the Oswaldo Cruz Foundation and Bristol-Myers Squibb Company' (hereinafter referred to as the "Agreement"). The Agreement was obtained through access to information channels and provided by the Brazilian Interdisciplinary Aids Association. The agreement shows an estimate of a 5.0% reduction in the price of atazanavir per year. This percentage was used to estimate the price reduction from 2012. The analysis enabled inferences about the conditions of the technology transfer to be made. 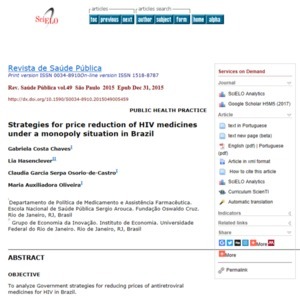 CHAVES, Gabriela Costa et al, “Strategies for price reduction of HIV medicines under a monopoly situation in Brazil,” Curadoria Enap, acesso em 19 de abril de 2019, https://exposicao.enap.gov.br/items/show/943.